Findecor Montreal painting company recently made the acquisition of a brand new pressure washing machine. But what is pressure washing used for? Our pressure washing gun is so powerful, with a pressure that goes up to 4000 PSI, that we can now strip the paint from the metal. In order to do so, our machine uses up to 7 water gallons per minute! It’s also possible to heat the water up before using it with our washing machine, and it’s necessary in some cases. Pressure washing is useful to clean as well as to strip. We can use it safely on surfaces of all kinds before proceeding to exterior paint jobs. Pressure washing to clean It’s possible to clean wood, PVC, aluminum sheets, metal, brick walls, stucco, stones, cornices, moldings, etc. When a surface shows a mildew problem, we add a specially designed product to the water. It’s also possible to clean glossy surfaces by adding a detergent (grease-remover) and by heating the water. 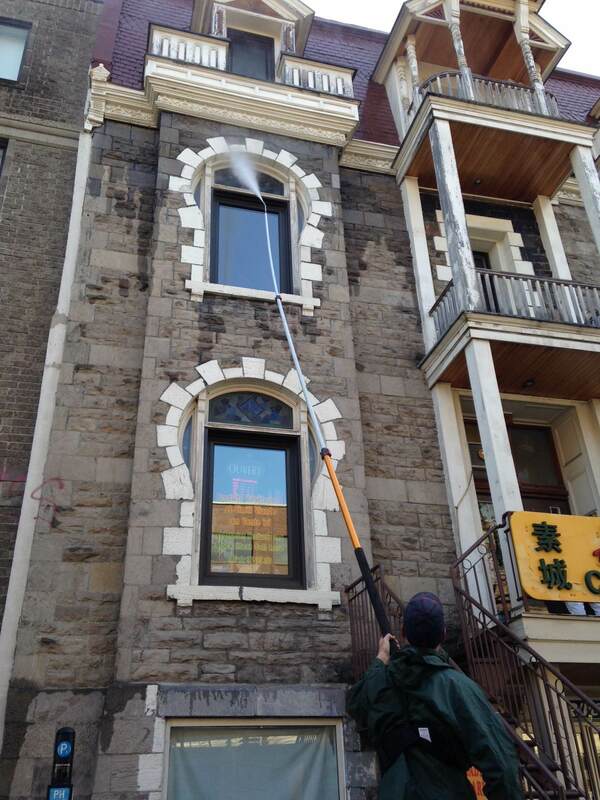 Indeed, the pressure washing tool allows us to clean various surfaces. But when using the maximum pressure, it’s also possible to strip metal to remove all rust and old paint that peels. We can also use the washing machine with sand: by propelling sand on a dirty or porous surface it will become very smooth. We will then clean off the sand with water before applying the paint. 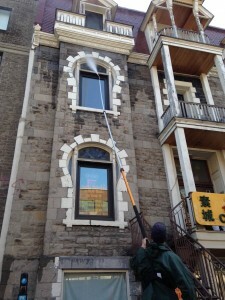 Because of the smog there is in Montreal, we need to pressure wash almost every exterior surface before painting them. The air pollution leaves a dust film on the walls, which lessens the adherence, hence the durability of the paint. For more information, do not hesitate to contact us! To learn more, visit this page.